In this paradigm, the positive reinforcing properties of a test substance are demonstrated by showing that animals prefer environments previously associated with the substance. 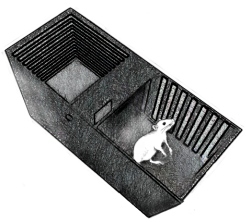 Animals are conditioned in a two-compartment box in which they are allowed to explore one compartment under the influence of the test substance, while the other compartment is always explored after administration of vehicle. An increase in the time spent in the drug-paired compartment after conditioning suggests the presence of positive reinforcing effects (drug-induced place preference). This test is useful for investigating the positive reinforcing properties of a test substance as well as its abuse potential.